Is this what mediaeval Grey Friars looked like? 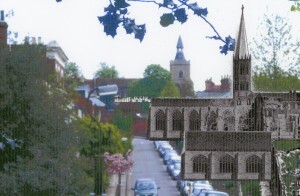 Dr John Ashdown-Hill (of ‘finding Richard III’ fame), a leading academic in the field of mediaeval study, has worked on a new interpretation of how the original Grey Friars church may have looked, and equally importantly, its location. 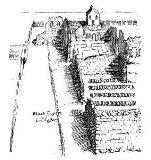 Using the 1718 sketch of the above-ground remains, above, by William Stukeley (who also drew St Botolph’s Priory), augmented by various pieces of evidence from other reports on the site, plus adjustments to pictures of existing Franciscan friary buildings, he has suggested how the site may have been laid out. First revealed in a recent keynote lecture to the Essex Society for Archaeology and History, John has shared his material with our project.